February’s Recipe is an easy fruit and cheesy snow ball to serve to friends and family. While it might be snowing outside, this month’s recipe will warm your heart and taste buds! Roll into 1-in. 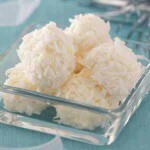 balls; roll in coconut. Refrigerate for 6 hours or overnight.Yield: about 2 dozen. 1 piece (prepared with fat-free cream cheese) equals 67 calories, 5 g fat (5 g saturated fat), 1 mg cholesterol, 55 gm sodium, 4 g carbohydrate, 1 g fiber, 2 g protein. Diabetic Exchanges: 1 fat, 1/2 fruit.